Can Water Lilies Survive Without Soil? When Do Asiatic & Oriental Lilies Bloom? Popular for cut flower arrangements and a favorite in wedding bouquets, stargazer lilies have beautiful raspberry pink to crimson star-shaped blooms. Reaching up to 8 inches across, these 2- to 3-foot tall beauties bloom midsummer through fall. Winter care is simple and will ensure blooms the following season. Pinch off blooms below the seed pocket at the base of the trumpet as they begin to fade. This encourages the bulb to store energy for next season rather than expend it on seed production. Leave the lily stalks and foliage to die naturally after the flowering season ends. The green foliage and stalk feeds the bulb for the next season's growth. Cut stalks back to the ground once all foliage has turned brown and wilted completely, typically by late fall. Apply a 4- to 6-inch layer of organic compost, such as pine bark, over new plantings of stargazer bulbs after the frosts set in. Bulbs will enter dormancy but must be protected during the cold weather. Mulch helps retain moisture and heat in the soil. Leave established stargazer lily bulbs uncovered in subsequent winters if your area receives heavy snow fall. The snow acts as a natural mulch, providing the protection required. Cut off the flowers once they begin to wither and die. Snip them off ¼ to ½ inch beneath the flower head with a pair of clean garden shears. Trim off any damaged or dead leaves from the plants to keep the bed looking neat. Cut them off evenly at the base of the leaf with shears. Leave the foliage and stems in place until the plant begins to die back in the fall. Cut off the remaining yellowed leaves at the base once they are completely wilted. Leave green foliage in place, as the lily needs this foliage to replenish its nutrient stores. Dispose of all removed plant material by placing it in the garbage or in a compost pile. Avoid leaving the old plant matter in the garden bed, as this may become a breading ground for disease. Stargazer lilies are sun-loving perennials that require at least 6 hours of direct sunlight each day. Large quantities of partial shade will hinder the plant from reaching its full color and thriving through the entire season. Stargazer lilies require nutrient soil, complete with equal amounts of phosphorous, potassium, and nitrogen. Stargazer lilies prefer a well balanced soil with pH levels between 4.5 and 7.0. The soil must be free of rocks and debris, somewhat sandy, and be well drained to prevent the roots from having wet feet. Stargazer lilies have varying blooming periods but generally range from early summer through mid summer. Blooms can last from 14 to 20 days when full sun, nutrient soil, and water levels are maintained. Stargazer lilies are highly toxic to cats. If eaten, cats can experience vomiting, lethargy, kidney failure, and possible death. The feline species is the only species known to have adverse effects from eating this flower. Prune the flowers after they have bloomed. Simply snap the old blooms off with your fingers. Wait for the foliage to turn brown before pruning. It may be difficult to wait since after blooming, Asiatic lilies may not be considered attractive. However, depending on the variety and style of the stems, you may be able to bundle the leaves in your hand, fold them over and tie them together with some string. This will still allow the leaves to absorb sunlight and turn it into sugar through the process of photosynthesis, but not take up as much room in your garden. You can then plant blooming annuals around these bundles to bring color back to your garden, if you desire. Use clippers to cut off the foliage, about an inch above the soil. For healthier lilies, do this only after the leaves have turned brown, generally sometime in the fall. You can wait to prune them back, but be sure to get it done before the Asiatic lilies start growing again in the spring. Water lilies are a variety of aquatic plant that easily grows in wet soils in still water, but can also be grow in water only without soil, as long as the water temperature is over 70 degrees Fahrenheit. Choose a site for your lilies that gets full sun. The soil should be well drained or the bulbs will rot. Make sure that water does not collect in the area after a rainstorm. Improve the soil. Add a 2-inch layer of peat moss and a 2-inch layer of compost to the surface of the soil. Turn the soil over with a shovel, and dig down 6 to 8 inches to incorporate the peat moss and compost into the soil. Rake the surface smooth. Plant the lily bulbs 8 to 10 inches apart in groups of three. Space the groups about 18 to 24 inches apart. Dig a hole large that is wide enough to accommodate the group of three bulbs and twice as deep as the diameter of the bulbs. Set the bulbs into the hole with their pointed end up. Backfill the hole. Firm the surface of the soil gently but firmly with your hands. Water the bed after all the lilies have been planted. Mulch the planting area with 4 to 6 inches of organic mulch such as hay, straw, shredded bark or wood chips. 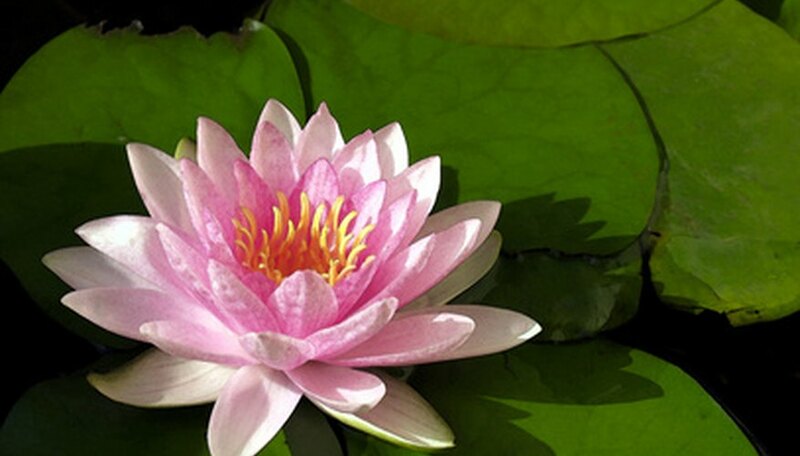 Remove the water lily from its container. Use a hose to wash off all the soil from its roots. Select the rhizomes that have the most new root growth (located near the top of the rhizome) and cut them away from the larger mass with a sharp, sterilized knife. Trim away all of the old and new root growth, one-third of the rhizomes' length from the bottom, and any damaged foliage. Fill the container three-quarters full with aquatic planting soil and 10 grams of 10-20-10 fertilizer for every gallon of soil. Plant each divided tuber into its own plant so that it is growing at roughly the same height that it was in its original container. Cover the top of the soil with a 1-inch layer of pea gravel. Submerge newly divided water lilies in roughly 1 foot of water until you see new leaf growth. Once they have sprouted a few leaves, they can be moved to a deeper, more permanent home. Asiatic lily bulbs are planted in mid fall, from about September 15 to October 15 and should be planted before they dry out. Purchase lily bulbs that will work in your garden. Look for height, color and flower structures that complement the flowers that already exist in your garden. Also make sure that the type of lily you choose is cold hardy in your region. Choose an area with full sun or light shade and organic, slightly acidic, well-drained soil. Lilies will survive in almost any soil type as long as it is well-drained. Place down a 1- to 2-inch layer of organic compost. Mix it about 8 inches into the soil with a spade. This will increase the nutrient content of the soil. Plant lilies in groups of three to five identical lily plants. Space these 8 to 12 inches apart in groups 3 to 5 feet apart. Measuring from the top of the bulb, place small bulbs 2 to 4 inches deep and large bulbs 4 to 6 inches deep. Place a 2- to 3-inch layer of mulch around the lilies. This will conserve moisture, keep weeds down and protect the soil from sudden temperature fluctuations. 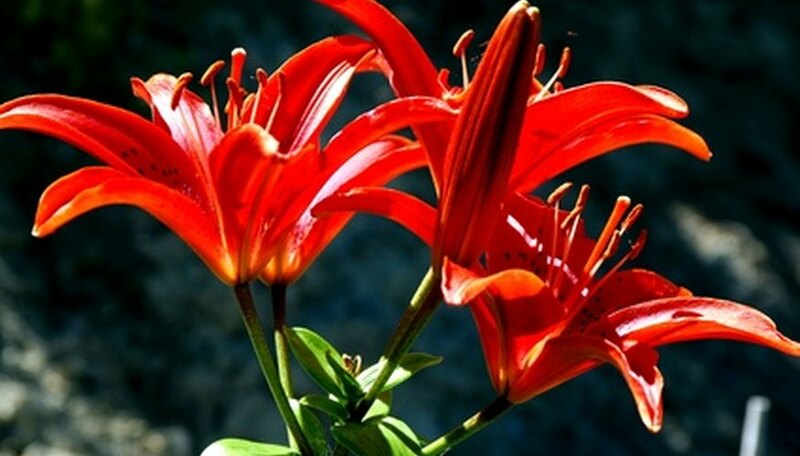 Asiatic lilies typically bloom in early summer, while Oriental lilies bloom from mid to late summer. Properly selected, they produce a long succession of summer color. Asiatics 'Enchantment' and 'Malta' bloom in June and July. Oriental 'Muscadet' flowers in July and August, and 'Miss Rio' blooms from July to September. 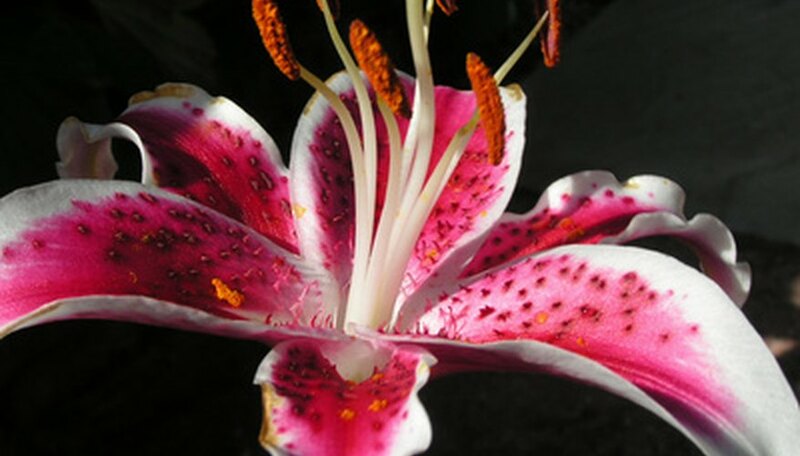 Carefully break spent Asiatic lily blooms from the stems by hand as soon as they wilt and fade. This will prevent the plant from wasting its energy and resources on producing seeds. Healthy specimens of some varieties fooled into thinking that no seeds have formed may reward you with another round of blooming late in the summer. Cut Asiatics for use in your fresh arrangements, but take care not to remove more than the top third from any single stem. The plant needs as much of its stem area intact as possible to store next year’s blooming energy. Cut down the brown, dead foliage late in the fall. Cover your Asiatic lilies with a thick layer of straw much for the winter. This will help protect the bulbs from brutal cycles of freezing and thawing.